Harvest Rescue is in full swing with fruit trees ripening all over town! If you (or your neighbor) have a tree that you need help picking – give us a call! Or would you like to volunteer to pick? Volunteers keep 1/3 of the fruit, the Cupboard gets 1/3, and the homeowner keeps a third. If you’d like to volunteer you must fill out a waiver first. 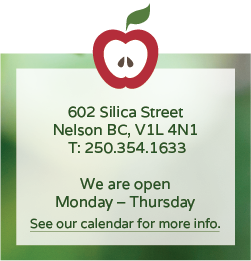 Printed copies of the waiver and information sheet are available at the Nelson Food Cupboard office during our open hours or click the link below to print a copy that you can sign and drop off. This year we introduced an expanded version of Harvest Rescue. This spring Garden Gnomes (volunteers ready to garden and help grow vegetables) were matched with underutilized gardens and spaces. We have been helping out all spring and summer at gardens all over town, and two local farms: Mad Dog Farm and Kirtzinger Farm. Have you seen our signs at the Nelson and District Community Center, McKim Cottage, and the Friendship Outreach Clubhouse?